After years of waiting it’s time for another adventure with the Parr family! After 14 years of asking and waiting for a sequel to The Incredibles, it’s finally here! Does it live up to the hype? Yes and then some! 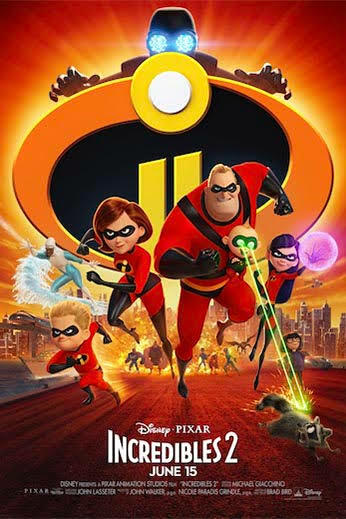 Incredibles 2 takes the Parr family on a fun, action packed adventure that is not only a great sequel but one of the best superhero films I have seen in a while. The story centers around Mr. Incredible (Craig T. Nelson), Elastigirl (Holly Hunter) and Frozone (Samuel L. Jackson) as they become the key members of an initiative to bring back the legal status of superheroes. They are invited by tech billionaire Winston Deavor (Bob Odenkirk) and his sister Evelyn Deavor (Catherine Keener) who make Elastigirl the face of the initiative by sending her out to stop crimes and to save civilians. During one of her missions, Elastigirl stumbles across a new villain named the Screenslaver and works to unravel the mystery. While that is going on, Bob is at home taking care of Dash (Huck Milner), Violet (Sarah Vowell) and Jack-Jack (Eli Fucile), trying to prove that while Ellen is away he can do just as well with taking care of the kids. Writer/Director Brad Bird (The Incredibles, Tomorrowland) delivers a film that is not only a lot of fun but worthy of the original. The writing is dynamic, with most of the jokes sticking the landing. This is definitely one of the funniest Pixar films in recent memory. While there is a lot of humor and action here, there is also tons of heart. There are a lot of super-powers on display here but what Bird teaches us is that the greatest power that you can have is love. The story does fall into predictability a bit with the reveal of the villain and the events of the third act, but I will let you discover that for yourselves dear readers. The animation in this film is incredible (pun intended). Every scene is gorgeous and detailed. The facial features on each character look fantastic and the action set pieces rival that of a live action summer blockbuster. The set pieces are bigger and bolder and the sequence with the Underminer is frantic and fast paced that will leave you catching your breath. Every single hero’s powers are on display here, from the multiple powers of Jack-Jack to the portals created by the newcomer Void. Most of the time bigger is not always better but this film is the exception to the rule. I really enjoyed this movie and it will most likely be on my list of favorite films of the year. Once again Pixar delivers.